"Nine members of the I.O.M. Volunteer Rifle Corps are going to the war in S. Africa on active service" So it is officially announced now that the Manx Nation is coming out so strong on the side of Great Britain, all ground for misgiving as to the prolongation of the war disappears." Daily Paper. "Now We Shan't be Long"
The background to the war and other Manx Servicemen are covered elsewhere. "On 12th December 1899 I made application to the Governor of the Isle of Man for permission to raise the battalion to the full number authorised by the War Office two companiesin order that an offer might be made for a contingent to proceed to the front, but for this, so far, I have received no authority. The Insular Government. has apparently thought in years past that. the Volunteers have been a very heavy charge upon its resources, and even now, it has shown little desire to promote the efficiency of the Force. In the circumstances I fear it will be impossible for this Battalion of one company to furnish even a full reserve section; but I shall at once approach the Governor with a view to obtaining permission to offer such a section." 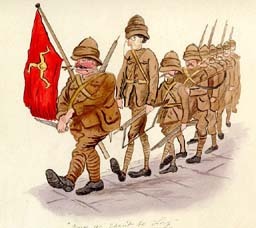 In the end nine men of the Isle of Man Volunteers proceeded to South Africa with the 6th Battalion of the Kings Liverpool Regiment. The above cartoon, of which I think I have the original coloured version, shows, I think, Major Stephen, possibly Private Clague who was especially noted as being the tallest man in the company and the volunteers. The battalion, together with the band. assembled at the Drill Hall shortly after eight o'clock. Captain Mackenzie was in command. and Lieutenants Rigby and Cowle were also present. The men fell, in, and headed by the. band, with the active service men in the centre and the rest of the battalion bringing up the rear, marched off by way of Peel-road, Athol-street, and Victoria-street, to the Pier. A large crowd followed the Volunteers along the streets, and at ever corner there were numbers of people gathered, who cheered repeatedly. On the pier there was a large gathering of people, the morning being fine and sunny,, The men formed up inside the railings and after some more handshaking, and expressions of good wishes from their comrades; they marched on board. As the steamer left :the pier, the band struck up "Rule Britannia," and the Volunteers and the people on shore raised three hearty cheers, which was responded to by the men on board. On Easter Monday night (the evening previous to departure) the men who have left for the front were entertained to dinner at the Grand Hotel by the officers of the corps. Capt-Mackenzie was in the chair. and Lieutenants Rigby and Cowle supported him. Segeant-Major Thomas, Colour Sergeant Maden, and bandmaster Poulter were present, and the nine men completed the company. Quarter-master-Sergeant Cubbon being unable to be present. Mr Doe was the caterer, and after justice had been done to an excellent dinner, a short time was spent in friendly fashion.. One or two of the men sang. and Captain Mackenzie in the name of the corps wished the young fellows good luck. Letters were read from his Excellency the Lieut.-Governor, and from the corps chaplain (Canon Savage). , The men were each presented with a pipe and a. New Testament from the chaplain. a cardigan jacket from the Governor, and woollen clothing from the officers. On-Easter Sunday the men attended at St. Thomas' Church, when the Rev Canon Savage addressed them. The six members of the active service section were Corporal Corrin, Coporal W. Christian, Private T. Abbot, Private J. Patterson, Private T. Clague and Private H. Colquitt. And of these six five returned to Douglas on Wednesday last. Corporal Corrin, who was formerly a clerk in the office of the attorney General, so liked South Africa that he elected to remain behind, and his friends will be delighted to hear that he had substantial reasons for so doing - in other words he has secured a good appointment in connection with one of the Colonial military forces. They returned to Douglas to an ecstatic reception of some thousands who had gathered on the Pier to welcome them - they marched, led by the band, along a flag-decorated Peel road to the Drill Hall (now the Wool marketing office). After this they went to a banquet at the Grand Hotel where they were entertained to dinner by the Mayor and Corporation of Douglas . Other military present were Capt Mackenzie, Lieut, Rigby and Lieut. Cowle (7th V.B. King's Regiment), Surgeon-Major Saville (5th V.R. Manchester Regiment), Major Stephen (late 7th V.B. King's Liverpool Regiment and Colonel Drinkwater (Inns of Court Volunteers). B.E. Sergeaunt A Military History of the Isle of Man Arbroath: Buckle & Sons 1947.